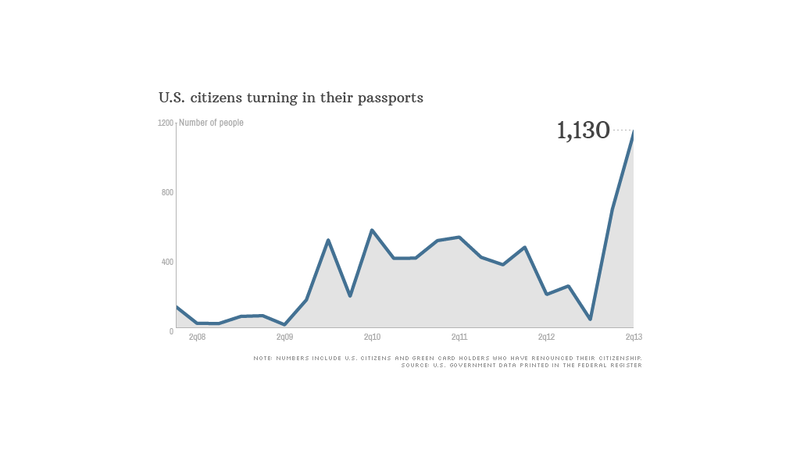 The number of Americans choosing to give up their citizenship has spiked dramatically this year as the government works to implement a new disclosure law aimed at stamping out tax evasion. Some of the rush may be caused by Americans hoping to avoid the new disclosure requirements. Others living abroad say they are giving up their U.S. passport because they are tired of dealing with overly complicated tax filings. Unlike most countries, the U.S. continues to tax citizens on all income, regardless of where it is earned or where they reside. For expats, filing taxes in two countries often means wrestling with a huge mountain of paperwork. "Every year, I was spending about $600 to $700 having somebody do the tax paperwork," said Kim-Fredrik Schneider, who now resides in the U.K. and retains his Swedish passport. Schneider, who hasn't lived in the U.S. for about 13 years, was one of at least 1,800 people to renounce U.S. citizenship or give up their green cards in the first half of 2013. In the second quarter alone, there were 1,130 renunciations according to government data -- more than the 932 recorded for all of last year. The increase comes as the U.S. prepares to implement the Foreign Account Tax Compliance Act, a new law that requires foreign institutions to report all assets owned by Americans. The measure, approved by Congress in 2010, is aimed at recouping some of the hundreds of billions the government says it loses each year in unpaid taxes. The law also requires individuals with overseas assets to file additional forms. Most people renouncing citizenship are "hardly the 'fat cat' tax exiles," said Eugene Chow of Hong Kong immigration firm Chow King & Associates. Instead, Chow said, clients who choose to give up their citizenship are often "really very ordinary people" who find it difficult to comply with the ever-changing tax code. Immigration lawyer Melissa Vincenty of Fragomen recalled one client, a woman nearing retirement age, who gave up her citizenship for the same reason. She had been filing taxes as an expat for nearly four decades, and didn't want to deal with it anymore, Vincenty said. While the paperwork is certainly a burden, concerns over wealth preservation can also be a contributing factor. Eduardo Saverin, one of Facebook's four co-founders, is one of the wealthiest individuals to give up his passport, and has since taken up residency in Singapore. Saverin officially expatriated from the U.S. last year, before Facebook's IPO. The Brazilian native insists he did not renounce his citizenship for tax reasons, but his move still drew criticism from high-profile lawmakers. Even individuals who are not among the super rich are considering giving up their citizenship -- especially when lower tax rates beckon in other countries. Americans are looking down the road at how their investments such as retirement funds will be taxed, Vincenty said. Giving up your US citizenship, she said, is a "realistic option to be able to manage those tax burdens." For those who haven't paid their taxes, giving up citizenship isn't an easy way out. The government can still go after former citizens if evidence of tax evasion surfaces. There is also a hefty exit tax applied for Americans who have assets over $2 million, he said. Even the heirs of people who have given up their passports could be responsible for taxes on inherited assets, if they remain U.S. citizens. Chow, the Hong Kong lawyer, said this is by design. "[The U.S.] wants to charge you for the privilege of leaving, so you won't have an incentive to get out," he said. "In their zeal to nail people with offshore accounts evading tax, they pass these rules that make life very, very difficult for ordinary people." Taxes aside, bidding Uncle Sam farewell can be an emotional decision, Vincenty said. "Lots of people are torn about it." Schneider framed the issue in more philosophical terms. "Am I still American? Well, I certainly sound American; I know a heck of a lot about American culture," he said. "I haven't stopped being who I am just because I don't have a contract with the government." Are you an expat who has faced challenges with your bank accounts or taxes in recent years? Email Sophia Yan and you could be featured in an upcoming story for CNNMoney.com.